Normally at this time of the year we are planning our first ski outing or getting ready for the Thanksgiving feast or beginning our Christmas shopping; however, in 2012 after canceling our trip to Argentina due to Jane’s bicycle accident, I decided to make another fishing trip. The primary impetus was the forecast for a high temperature of 69 in Denver on Wednesday November 21, the day before Thanksgiving. All the local streams were exceptionally low, and I wasn’t up for another long trip to the Arkansas River, so I opted for The Big Thompson River below Estes Lake. 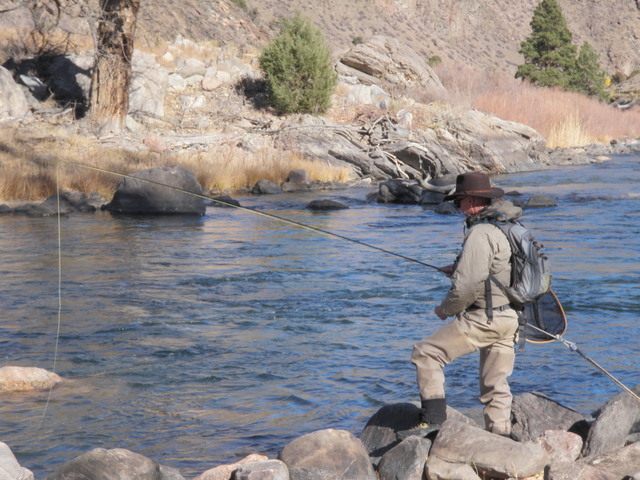 The DWS tracked flows of around 21 cfs and that is less than 50% of what Dan and I experienced on our last trip, but I felt those flows would still offer decent fishing. I left the house slightly before 9AM and didn’t expect to begin fishing until 11AM allowing time for the sun to heat up the air and water. I made better time than I anticipated and found myself on the water by 10:30AM. I elected to drive roughly .5 mile beyond the location fished on my recent trip with Dan to a place where a large pullout exists on the right side of the highway. 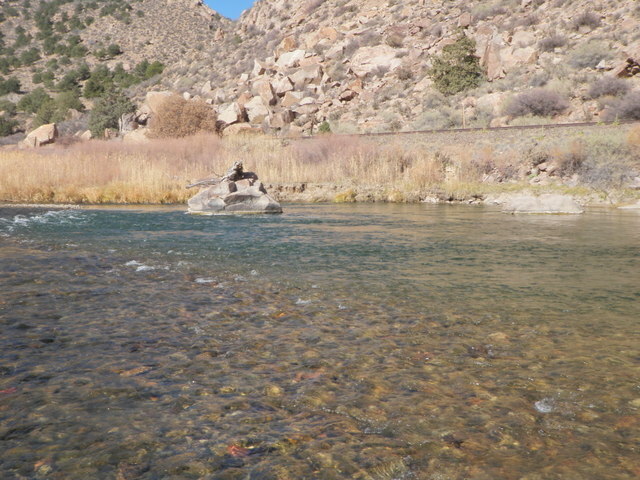 Unfortunately the temperature in the canyon was in the low 50’s as I dressed to fish, and to make matters worse a chilly breeze blew on a fairly frequent basis. I elected to wear two top layers and never during the course of the day did I feel overdressed. I rigged up my Orvis Access four weight and walked down the shoulder of the highway a ways to a point below a short stretch of steep gradient with numerous deep pockets. I expected to fish with nymphs, but the flows were low and I felt like the indicator landing in the water would spook the fish, so I changed strategy and tied on a size 18 deer hair black stonefly dry fly. I had three remaining flies that I tied after my inital encounter with these insects on South Boulder Creek. After tying on the stonefly imitation I began prospecting the pockets quickly but experienced no success until I reached the top of the steep gradient area where the river fanned out in some slower moving pockets, and here I spotted several fish hanging at the tail of some pools. I executed quite a few drifts over these fish and eventually as I lifted my fly right at the lip of the pool a fish slashed at my fly, and I experienced a momentary hook up. I was disappointed that this did not result in a landed fish, but I was pleased to create some action on a surface fly this late in the season. 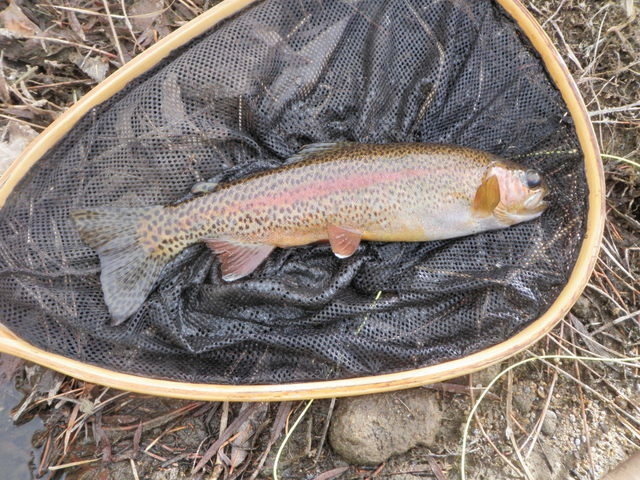 I switched to another attractive stretch of water above the pool just described and once again felt a brief moment of weight on my line when a trout grabbed the stonefly as it skated near the top of a pool. So far the fish seemed to be interested in movement in order to expend energy and chase. To my left there was a nice deep hole next to a faster run just below a large exposed boulder so I popped a cast to the upper edge of the current seam and on the second or third cast a fish tipped up and sucked in the deer hair fake causing me to set the hook and play a chunky 8-9 inch brown trout into my net. Success! 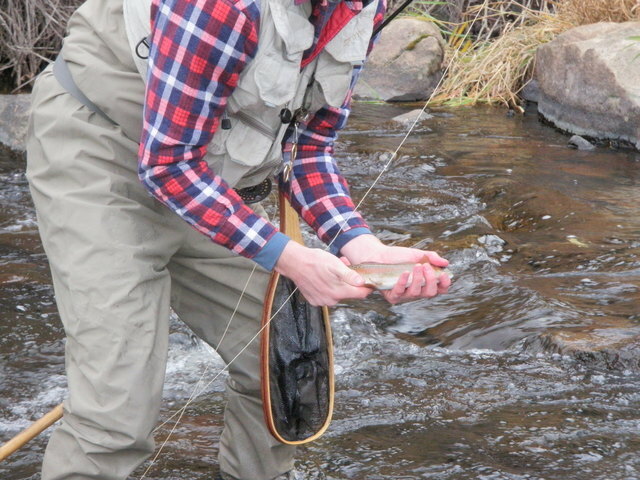 I had managed to dupe a fish to take a dry fly in late November. Meanwhile it was quite chilly and the wind was gusting on a fairly regular basis making it quite difficult to cast my tiny dry upstream, and this doesn’t even begin to describe the challenge of placing casts on my desired targets. After releasing the brown I found myself just below the tip of a long narrow island, so I elected to fish the larger left channel that flowed next to the road. There was a long smooth pool of moderate depth that flowed almost the entire length of the island so I began shooting long casts 25 feet upstream and along the island bank. This proved to be more difficult than it sounds due to the everpresent breeze, but after I’d moved eight feet above the lip of the pool, I spotted several decent fish finning no more than seven feet in front of me. They were moving periodically so I felt they were eating and not just sulking on the bottom of the stream. After numerous drifts with the stonefly it became clear that they were not interested in my offering so I clipped it off and tied on a size 14 olive stimulator and then extended some 5X tippet off the bend and added a small beadhead midge larva with a silver rib. I cast this combination above the deep trough where I spotted two fish and on the fourth or fifth drift the stimulator dipped, I set the hook and discovered myself attached to a pretty twelve inch rainbow thrashing madly on the end of my line. I was excited that my change in approach resulted in a hook up and also optimistic that the midge larva might be the hot fly that led me to numerous additional catches. Alas as I clung to this thought while probing the remainder of the pool and then working some sweet water above the island, it became just that, only a thought and not reality. It became clear that the stimulator and midge larva were not the winning combination I had envisioned so I clipped off the stimulator and tied on a Chernobyl ant and below that added a beadhead hares ear. The hares ear had been my salvation on the Arkansas River, so why wouldn’t it produce on the Big Thompson in a late season test? I worked the Chernobyl through quite a few attractive pools and runs as I now approached the stretch directly across and slightly below where the Santa Fe was parked, and I’d pretty much given up when a rainbow rose and slurped the Chernobyl at the tail of a small but deep slow moving pocket ten feet out from the bank next to the road. 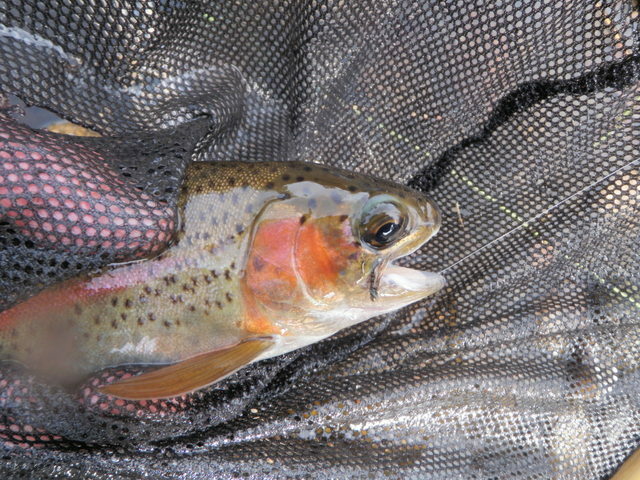 I was pleased but surprised with this turn of events as I released the rainbow and noted that I’d caught three fish on three different flies, but struggled to find a commonality to repeat. I glanced at my watch and noted that it was a few minutes after noon and my feet were getting quite chilled, so I decided to head back to the car and grab my lunch. The wind had died back a bit and the sun was now high in the sky and creating some warmth, so I carried my lunch bag and water bottle across the highway and found a nice rock in the sun to use as my lunch bench. I was right next to another nice long deep pool and as I downed my sandwich, I spotted a pair of trout along the left side of the pool. I made a mental note of their position and commited to drift my Chernobyl and hares ear over these fish. As is my custom after lunch, I returned to my point of exit before lunch and continued prospecting the likely trout holding locations. As the afternoon progressed I became less thorough in my approach and sought out the places similar to those that produced in the morning. I reached the long pool near my lunch spot and drifted the Chernobyl and hares ear over the spotted fish, but unlike my vision during lunch, they paid no attention to my imitations. I decided it was time to change strategy again and decided to go back to the size 18 deer hair stonefly. I’d only landed one fish on this fly; however, I’d also induced a few looks, refusals and momentary hookups so this seemed to be creating the most interest. Perhaps only a small percentage of the fish were inclined to eat in these cold water conditions. From one to three PM I covered a fair amount of water casting the deer hair stonefly to every likely spot, and I managed to land two additional rainbows. One was another fine twelve inch fish with a brilliant red stripe on the side. Both fish were caught in similar water to my earlier catches; small but slow moving deep pockets, and they rose and sipped the fly right along the edge of some faster current. By three o’clock I reached another stretch of water that was moving faster due to a steeper gradient and the air was cooling as the sun dropped toward the west so I decided to quit and congratulate myself on five fish landed late in the season in spite of a chilly wind and low flows. In addition my arm was quite tired from repeatedly casting into the wind and raising my arm to keep the fly line off the water. I hesitate to close the book on the 2012 season because everytime I announce this intent, another warm weather system moves into Colorado. Will it happen again? 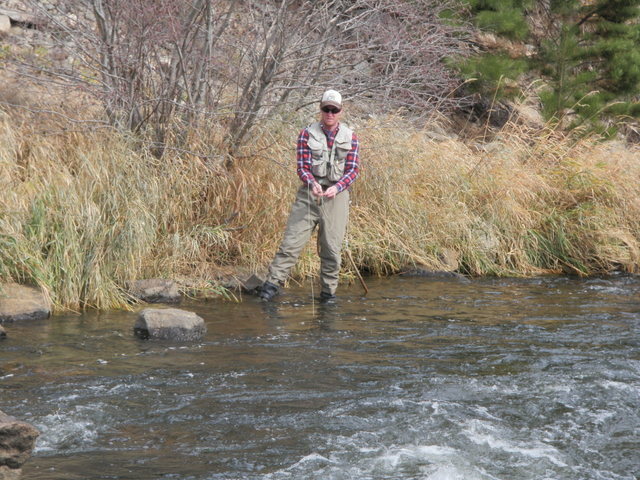 As Jane improved from her pelvic injury she yearned to get outside and offered to accompany me on a fishing excursion. Temperatures were forecast to reach the low 60’s in Denver and along the Arkansas River, so we planned a trip for Sunday, November 18. We left the house at 8:30 and arrived at the Royal Gorge Angler store outside of Canon City by 10:30. We did some Christmas shopping and then moved on to the Five Points Arkansas Recreation Access area. Jane got set up with her folding chair and reading material while I rigged my Sage four weight with the level line nymphing system. I began the day with an iron sally nymph as my top fly and a beadhead hares ear as the point, and I was in the water fishing just above the observation deck by 11:30AM. The weather indeed turned out to be quite pleasant for mid November with clear blue skies and temperatures that reached the low 60’s. The water above the protruding observation platform was fairly fast with many pockets and I covered it thoroughly with no response to my offerings. The next stretch below the small island was a bit slower and offered more attractive areas for drifting my tandem nymphs, but once again my efforts were thwarted. I finished the first hour off by working up the smaller left channel that flows around a small island above the access area until I reached a nice deep pool and eddy at the top of the left braid. I was certain this area would yield my first fish, but alas, after numerous expert drifts I reeled up my flies and returned to the picnic area. Jane and I retrieved our lunches and basked in the bright sunshine while munching down our sandwiches and other snacks. A cool breeze blew from time to time so I was glad I was wearing a fleece top. I decided to fish the huge hole next to our lunchtime picnic table immediately after lunch and Jane borrowed my camera to snap some photos. Again I was certain that the soft area next to the current seam below the large boulder would yield a fish or two, but once again I was proven wrong. Perhaps I needed to move away from the access area as it probably receives a large amount of pressure due to ease of access. 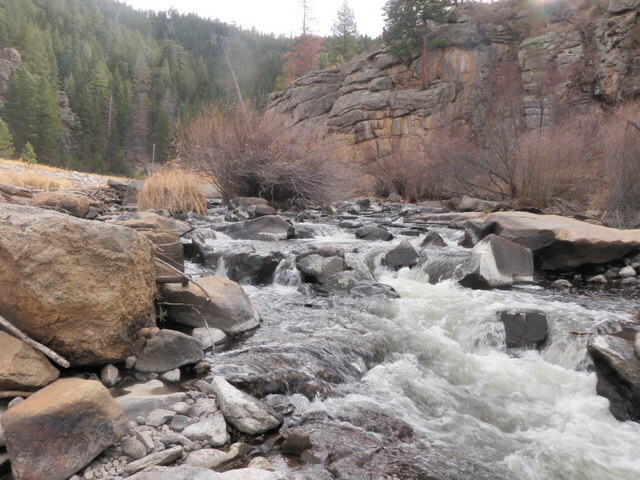 I walked down the shoulder of highway 50 for .4 miles and then slid down a steep bank to a nice location at the tail of a long pool that contained quite a few exposed midstream boulders. I broke off both my flies in the large pool next to Jane’s base camp, so I replaced the iron sally with a twenty incher and then added a new beadhead hares ear as the bottom fly. 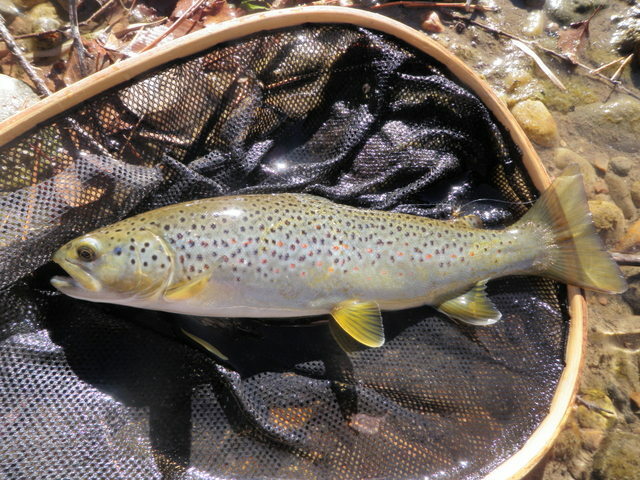 I began working my way up along the bank next to the road and fished all the likely spots and finally after fifteen minutes or so I was relieved to connect on a seven inch brown trout. Although this was a small fish it at least meant I wasn’t going to post a zero on this beautiful Sunday late in the season. As I worked my way back up to eventually meet Jane I landed four more small browns in the 7-10 inch range. 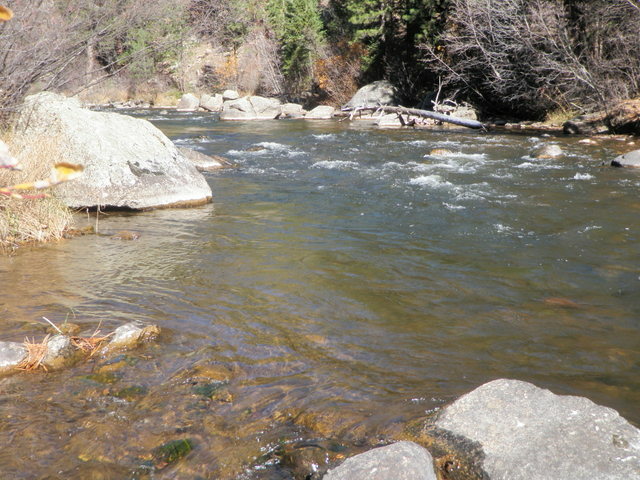 I seemed to catch all of them in small slow moving pools behind large boulders or off to the side of the main current. I cast my flies to the very top of the pool where the faster water tumbled over some rocks, and as the nymphs drifted slowly back through the top half of the pool a fish would grab the fly and cause a pause or twitch in the indicator. Of the six fish landed on the day five inhaled the hares ear and one had the twenty incher in its lip. One of the six fish was a 14 inch brown, but the back half of its body was covered with blotches of fungus, perhaps as a result of mishandling by a previous fisherman. By 3:30 I’d returned to Jane’s base camp and she seemed impatient to begin the return trip and I’d pretty much fished the entire stretch of river near the access area, so we decided to call it a day. The fish were on the small side, but it was a gorgeous unseasonably warm day in the middle of November, and Jane and I enjoyed yet another fun outdoor day in Colorado. I thought my last fishing day in Colorado was probably Sunday, November 4 on the Big Thompson River, but then I read the weather forecast for the following week and noticed a high in Denver of 74 degrees. Could I really ignore an opportunity to fish in unseasonal weather in November? Nope. 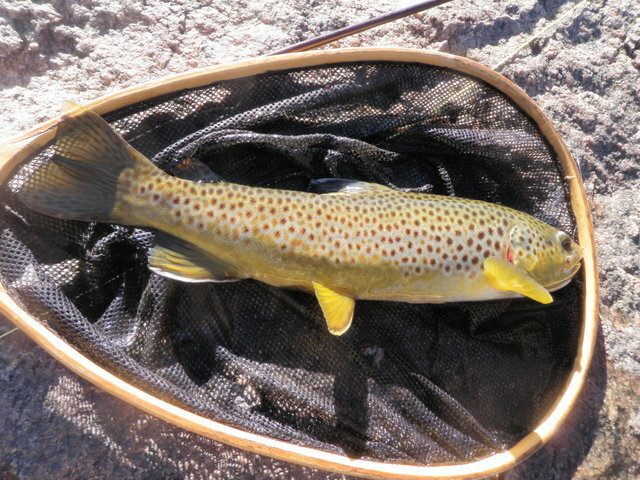 I read the Royal Gorge Angler fishing report and supposedly the browns were beyond their spawning period and eating everything that floated their way. I packed the car on Tuesday evening and had everything ready for an early departure on Wednesday morning. For some reason Jane and I both woke up at 5AM even though we had the alarm set for 5:45, so I was out the door and on the road by 6AM, much earlier than planned. This put me in Canon City at the Royal Gorge Angler fly shop by 8:30 to consult with Taylor Edrington and purchase some flies. I bought four iron sallies and five midge patterns as Taylor advised using the iron sally as the top fly and a chartruese midge larva as the bottom fly. Taylor also gave me a series of locations to try on the lower end of Big Horn Sheep Canyon. I decided to drive a bit farther than normal to Lone Pine access and parked in the first pullout beyond the entrance to the access area. The river was quite low at 200 cfs and it was rather apparent where the fish might be. I parked in the shadows and wore my stocking hat and several layers as the air temperature was probably in the high 40’s when I began fishing. My fingers were quite numb and chilled as I methodically tied on all the components of the nymph rig that I planned to deploy throughout the day. As Taylor suggested, I began with a size 14 iron sally as my top fly and the chartruese midge larva on the point. I walked down the road to the lower end of the Arkansas access area and began fishing a long run that ran along the north bank. Nothing was showing interest in my offerings so I moved to the top just below a monstrous exposed boulder and then retreated in order to skirt a huge deep pool. When I reached the top of the large pool I began casting and running drifts through the deep run and riffles at the head of the pool. These were nice long drifts as I cast the flies three quarters upstream and then allowed them to drift quite a distance downstream into the deep pool using stack mends. Unfortunately despite all this great technique, I was only practicing my casting and mending as no fish seemed to be present in this great water. Finally I decided to change flies, so I clipped off the chartruese midge larva and replaced it with a beadhead hares ear nymph. Taylor had mentioned that hares ears were working. After 45 minutes of fruitless casting, Taylor’s words proved to be correct as a nice 13 inch brown inhaled the hares ear in the middle of the deep run and I landed and photographed my first fish of the day. I moved upstream and at the head of another nice run of moderate depth felt the weight of a decent fish and landed another chunky twelve inch brown trout. Near the same location a smaller brown attacked the iron sally on the swing and I was now at three fish despite the chilly temperatures and the lack of action in the first 45 minutes. 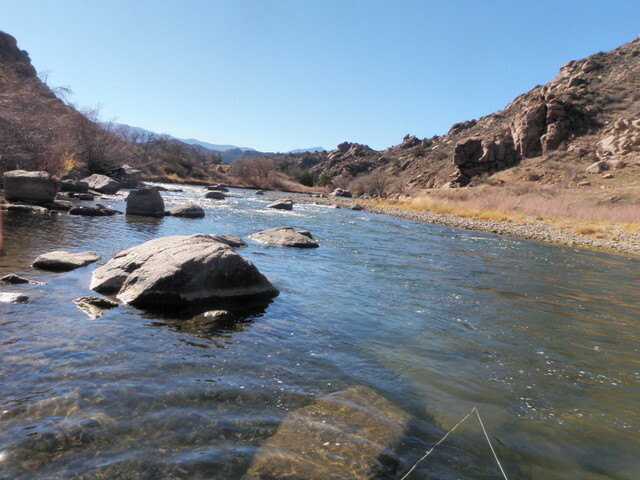 I was now opposite the Santa Fe so I paused and climbed the bank to retrieve my lunch and ate it by the side of the river as I looked for fish in the slow moving deep water opposite my lunch rock. There were no insects and no fish, but the sun was rising higher in the sky and I shed my fleece hat and one of my top layers as I stashed my lunch back in the car and proceeded to fish upstream from where I ended the morning. It was now 12:15 and before I made too much progress I snagged on a sunken stick that was lodged against a rock, and as I attempted to dislodge the fly, I snapped off the iron sally and the hares ear. Since the iron sally hadn’t really produced much, I decided to go with one of the twenty inchers I’d tied a couple weeks ago. This became my top fly and I added another hares ear as my point fly. I continued fishing this combination nearly the entire afternoon and landed another ten fish before quitting at 3:30. I probably covered a mile of water as there were long shallow areas or slow moving stretches that I essentially skipped. Since there were virtually no other fishermen in my path, I decided to focus on the prime spots which encompassed faster moving runs and riffles at the top of pools or behind large midstream boulders. Between one and two the action seemed to really improve as I landed four browns on the twenty incher including a heavy 15 inch brown that put up a fine battle. Through this period the hares ear continued to produce as well but it seemed that the average size of these fish was smaller than the twenty incher eaters. During the prime time I discovered that fish seemed to grab the fly when I jigged or bounced the two flies through a prime run or pocket. I cast to the top of a run behind a rock and then lifted and lowerd my rod tip as they drifted back toward me. Unfortunately I also foul hooked three fish and I’m not sure if this was caused by a late hook set. There were probably four or five momentary hook ups as well during the afternoon period. At one point around 3PM I got snagged to a large boulder in a deep area, and I was unable to wade to a position to free the flies. I applied pressure by pulling the line directly toward my chest, but it snapped at the knot where the split shot was attached. I decided to try a salvation nymph with the beadhead hares ear and landed a fish on the salvation and then numbers 12 and 13 on the hares ear. By 3:30 I realized I was quite a distance upstream of the car, so I began working my way back down the path along the bank until I reached an area where a steep exit route was obvious up the bank. 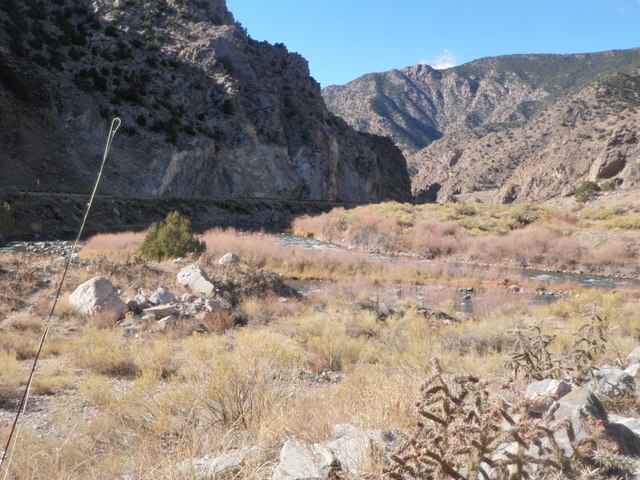 I climbed to the top and found a well worn trail that followed the river downstream to a gap in the fence, and from there I hiked back along the shoulder to the Santa Fe. Thirteen fish landed in early November was a challenging accomplishment as I fished hard and made an abundance of casts while covering a mile of water, however, the afternoon was gorgeous and it was quite rewarding to catch fish on recently tied flies late in the season. Jane felt she recovered enough from her pelvic fracture so that I could leave her to go fishing. In fact she was encouraging me to go, so perhaps she needed some time to herself. Dan texted me on Saturday morning (1AM!) to check if I was planning to fish, so I suppose the stars were aligned in favor of me getting out for another fishing outing in 2012. The weather forecast called for a high in the low to mid-60’s for Denver with overcast skies, so this appeared to be another favorable factor. Sunday appeared to be similar to Saturday but marginally warmer, so I replied to Dan that I planned to fish on Sunday and we made our plans. My original thought was to return to South Boulder Creek and hopefully experience the little black stonefly hatch one more time. On Friday I drove to Old Arvada and visited Charlie’s Fly Box to purchase some size 20 dry fly hooks, so on Saturday I spread these out on my fly tying desk and constructed twelve nice imitations using the charcoal sculpin wool that my friend Jeff Shafer shared with me. 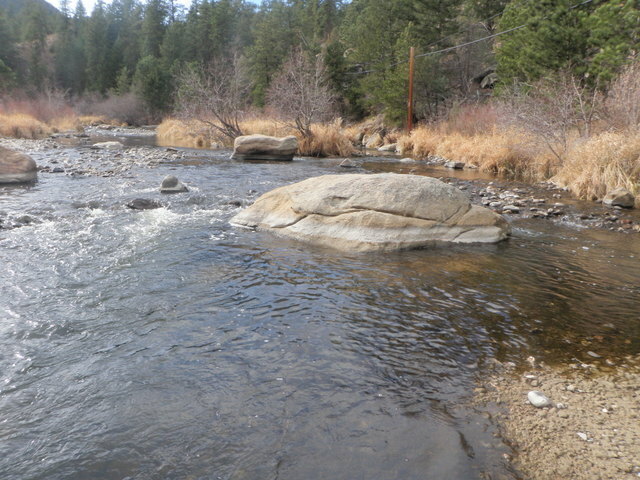 Unfortunately when I visited the DWR site on Saturday evening to check stream flows, I discovered that the stream flows on South Boulder Creek had dropped from 100 cfs to 14 and this happened on Saturday! I was reluctant to fish at such low flows particularly since it had happened recently even though I had some decent luck on a September visit at flows below 10 cfs. I checked the South Platte in Waterton Canyon and the web site registered 75 cfs so this emerged as a possibility. Clear Creek was running at 29 cfs, also quite low, but probably an option although Dan and I have grown a bit weary of the small Clear Creek browns. 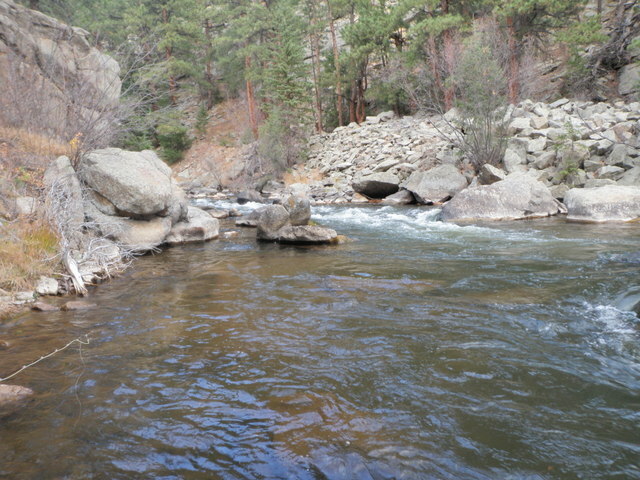 Finally I checked the Big Thompson River and the DWR site indicated 45 cfs below Estes Lake. The stream reports from the fly shops were favorable with the possibility of BWO’s on overcast days, so this was my choice. Dan agreed with my choice and we planned to meet at 9AM at my house. We had the advantage of an extra hour on Sunday morning due to the time change, but I wanted to leave earlier to account for the sun setting earlier in the day. I transferred all the flies I tied in October to the amber boxes in my fishing bag and inserted three of the little black sculpflies in one of my plastic fly boxes. We transferred Dan’s fly gear to my car, and we were on our way to Estes Park. Since Dan was accompanying and it was his first fishing trip to the Big T, I elected to fish starting below the first bridge downstream from Noel’s Draw, an area that I fished frequently and I knew it held a decent number of fish. We parked above the bridge and were ready to fish by 11AM. It was quite chilly with the air temperature around fifty degrees as we walked down the shoulder and across the bridge to the large bend along the road. Dan and I both began with a Chernobyl ant and a beadhead hares ear nymph as we fished through some deep pocket water in a narrow stretch just off the highway. The wind was gusting frequently and combined with the 50 degree temperatures sent chills down my back. Finally in a short pocket above the fast water, I felt the tug of a fish and brought a brilliantly colored rainbow to my net with a hares ear nymph in its mouth. Within a few minutes I watched Dan flick a back hand cast upstream to a narrow slot along the bank, and then he set the hook and his five weight bowed under the weight of a fine brown that smacked his Chernobyl ant. I continued working up the left side and arrived at a nice slightly riffled area with a depth of approximately three feet. Here I experienced two refusals to the Chernobyl ant so I decided to remove it and replace with a size 14 dark olive body deer hair caddis, and this provoked three more refusals in the moderate riffles. Clearly the fish were tuned into my fly but something was missing. Perhaps they required something smaller? I opened my plastic fly box and searched for the size 18 deer hair little black stoneflies I’d tied after my first encounter on South Boulder Creek. I flicked a cast upstream into the riffles where I’d experienced a refusal and a feisty rainbow nosed up and slurped in the stonefly. I netted the thrashing eleven inch rainbow and photographed it in case it would be my last fish of the day. After I dried the small stonefly I cast it to the right and spotted a swirl as it drifted back toward me and once again set the hook in a small but chunky rainbow. In short order I hooked and landed a third rainbow on the deer hair stonefly, and at this point I waded back to Dan and plucked another one from my box and presented it to him. Dan quickly removed his tandem rig and tied on the small stonefly and much to my amazement hooked and landed a nice brown on his first cast. Once he released this fish and dried his fly, he fired another cast upstream and landed a second trout on the black stonefly imitation. It all seemed so easy, but we continued fishing up the stream toward the bridge through some water that wasn’t quite as attractive and the stonefly feast abated. When we reached the bridge I suggested we break for lunch as my feet were cold and the wind was really chilling my hands. Dan agreed and we adjourned to the Santa Fe and feasted on our lunches while checking in on the Broncos. The Broncos led the Bengals 17 – 10, but Manning threw an interception while we listened, so that outcome remained in question as we grabbed our rods and returned to our exit spot just below the bridge. We waded under the bridge and continued to work the little stoneflies through some attractive water, but these fish apparently possessed different tastes. We both covered quite a bit of water with no refusals or takes, and I began to experiment with different flies. I spied one tiny BWO fluttering up from the stream so I tied a beadhead RS2 below the stonefly for a while. Next I switched the RS2 for a soft hackle emerger and again there was no response. The small stonefly was not buoyant enough to float with the small beadhead attached, so I switched it for a size 12 olive stimulator, and this elicited one refusal. Next I decided that the small soft hackle emerger wasn’t working and I needed something larger so I clipped off both flies and tied on a gray parachute hopper and trailed a salvation nymph. Finally in a narrow slot the hopper dipped and I hooked and landed a small rainbow on the salvation nymph. Unfortunately this success could not be repeated so Dan and I skipped over the remainder of the straight relatively narrow and fast stretch to the nice pool just after the large bend. By this time it was around 3:00PM and some high clouds moved in front of the sun. Dan had returned to the Chernobyl ant with a beadhead hares ear, so I decided to go back to what worked earlier, except I elected to tie on a little sculpfly instead of the deer hair stonefly. The little sculpfly had a charcoal sculpin wool wing and was tied on a size 20 hook. It was more difficult to follow in the riffled water, but I fired a cast directly upstream to the left of the main current seam and a fine rainbow rose and confidently sipped in the size 20 stonefly replica. It was quite gratifying to land a fish on a fly I designed and tied the previous day. A cast a few minutes later to an area higher up and to the left of the larger center current led to a swirl and I hooked another rainbow. This was perhaps my best fish of the day with a blend of pink, red, and purple hues in a wide band along the sides. Dan photographed my catch and tied on a small dark olive caddis, and we switched sides, and in a short amount of time he was attached to a pair of nice fish on his caddis. One was another bright rainbow and I snapped a photo of him cradling the shining jewel. It was now beyond the time we’d agreed to quit, but the action was heating up, so we continued upstream through some attractive pockets and riffles. I managed to land a nine inch brown that I spotted nestled on the bottom in a small pocket, and Dan landed another fish and experienced several refusals. Finally we reached an area where there was a break in the thick vegetation between the stream and the road, so we agreed to call it a day and returned to the car. 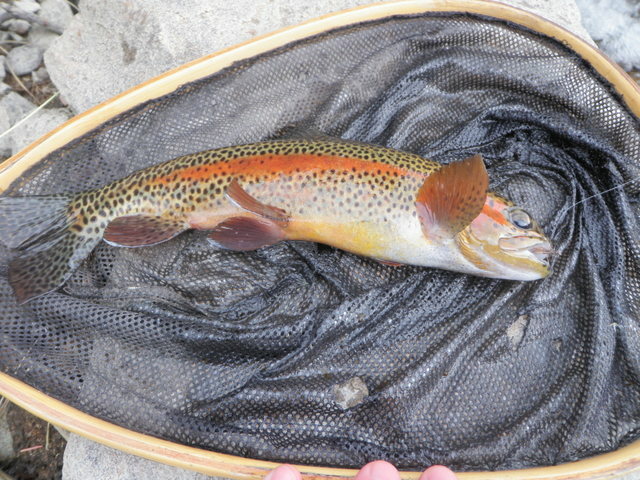 It was a fun productive day in early November on the Big Thompson, and we were both surprised that some of the best fishing occurred late in the afternoon when the sun dropped low in the sky and the air temperature plummeted. Location: Furthest downstream point I could go. The path ended. It’s rare in Colorado that I observe an aquatic insect that provokes surface feeding for which I do not have a decent imitation mainly because there are only a handful of significant hatches on the local streams. As documented on Sunday’s post I encountered a decent hatch of small black stoneflies on Sunday afternoon and I struggled to find a reasonable imitation among my inventory. On Sunday night I found myself with some spare time so I sat down at my fly tying desk and created my little black stonefly imitation. I placed a size 18 dry fly hook in the vice and began with some medium olive thread. I dubbed an abdomen of dark brown olive and then added a dark gray wing made from coastal deer hair. Finally I wound two or three turns of dark dun hackle to imitate the legs. 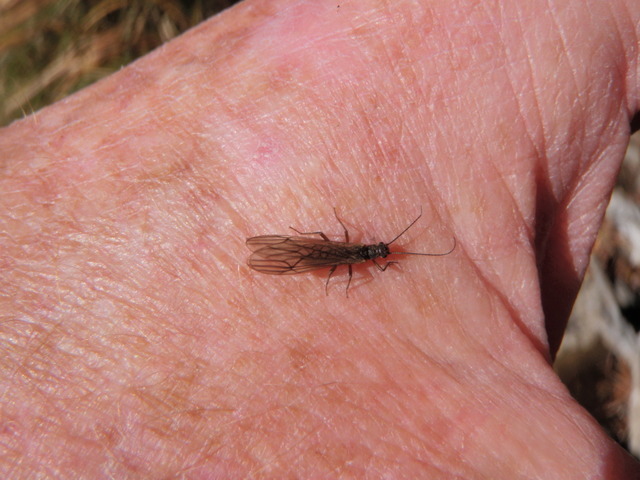 I created five of these little black stoneflies, and I was anxious to test them. Meanwhile the weather forecast looked pretty bleak for Thursday and Friday with the possibility of rain and snow and high temperatures in Denver only in the forties. Tuesday on the other hand was expected to be gorgeous with a high in the mid-70’s, so I shuffled my work schedule to take a day off on Tuesday and then work the remainder of the week. Of course I chose to visit South Boulder Creek so I could test my new stonefly creations on the resident fish, and I was certain they would give me a passing or failing grade. I took my time getting ready on Tuesday morning to allow for the air temperature to warm and departed the garage at 9AM and arrived at the parking lot by 10AM. I decided to rig my line for nymphing using the newly learned technique, so I sat down at the picnic table in the parking lot and tied all the connections except for the flies. I began hiking down the trail at 10:20 and decided to continue further than any previous ventures. This resulted in a 40 minute hike and ended where the path disappeared just above a stretch where the stream was too rapid to cross and my path was blocked by a huge vertical rock cliff. In order to continue I would have needed to scale the rocky hill to approximately 150 feet above the creek, so I decided to keep this little adventure for a future trip when I have a fishing partner; and therefore, entered the stream where the path ended. I tied on a salvation nymph as the top fly and beneath that added a beadhead RS2 and began working some deep pockets in a narrow fast section. 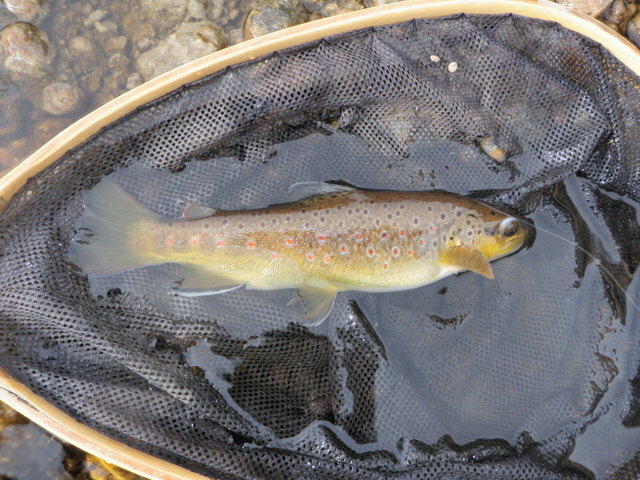 The third or fourth such pocket produced a small brown that plucked the drifting salvation nymph, but that was the extent of the action on the nymphs as I progressed upstream and eventually crossed to the opposite side. At noon I found a nice grassy spot on the south bank and decided to munch my lunch as I’d packed it in my backpack. After lunch I removed all the nymph components and reconnected my tapered leader and tied on a Chernobyl ant with a trailing beadhead hares ear. I worked this for a bit with no interest indicated by the resident trout, so I switched the Chernobyl for a stimulator and then eventually swapped the hares ear for a salvation and then a beadhead pheasant tail. None of these offerings worked as I now approached a beautiful long run below an exposed boulder near the north edge. I noticed a couple small dimples indicating that fish were beginning to feed on the surface and I’d also spotted a couple stoneflies flitting about so I tied on the new imitation I’d created for exactly this purpose. I clipped off the two flies and tied on the size 18 dark stonefly and flicked it to the riffled water at the top of the run. Guess what happened? A small fish rose toward my fly and turned away at the last instant, and then adding insult to injury, this happened a couple more times, but the action was initiated by different fish. I was pretty disappointed with my hatch matching capabilities as I removed the stonefly and noticed a larger mayfly, perhaps a PMD, steadily float up from the stream. I couldn’t find anything on the water so I decided to try a light gray comparadun as I usually do when fishing to a PMD hatch. Much to my surprise in short order a fish rose and sipped in the comparadun for my second catch of the day. By now three of four additional fish were rising sporadically in the current seam, but the comparadun was not to their liking. Could they be eating the stoneflies, but the color of mine wasn’t what they were seeking? I decided to try a size 16 light gray caddis and on the first or second cast a fish slammed the caddis, but slipped free as I played it. Again, however, when I cast the caddis to the location of the rising trout, I was severely disappointed as they ignored it just like the previous flies and continued to feed. As a last resort I tied on a different light gray comparadun, but this made no difference and I decided to tip my hat to the fish and move on. Perhaps other segments of the stream held less educated fish. Playing off of that thought, I slid to the south side of the stream again and continued prospecting with the comparadun. It was difficult to see and fish were not showing themselves until I approached a nice deep pool created by a dead horizontal log. I paused to observe the pool and spotted a rise and as I did this I was standing beneath a tree with some branches that extended over my head. It was around 2PM and all of a sudden the stoneflies got quite active as they swarmed around my face and several actually landed on my skin. Could the rise indicate that the stoneflies were finally touching down on the water? I once again tied on one of the flies I created for this occasion and flicked a cast into the lower end of the pool. Wham! A nice brown tipped its nose out of the water and confidently slurped in my fly. It worked! My observation and efforts to match the stonefly hatch finally paid dividends. Over the next hour I worked my way up along the south bank and picked off six additional fish on my dark stonefly. This was quite gratifying as the fish were taking the drifting fly without hesitation. By three o’clock the stonefly event had dwindled, and it was fortunate for me, as I lost my second size 18 stonefly on an errant high backcast to a pine bough. I had one more in my front pack, but decided to switch back to a Chernobyl ant with a trailing Craven soft hackle emerger. Between 3 and 4PM I landed number ten and eleven, and they were the nicest fish of the day. Number ten was a twelve inch brown that grabbed the emerger as I lifted the flies near the end of a drift tight to the bank. 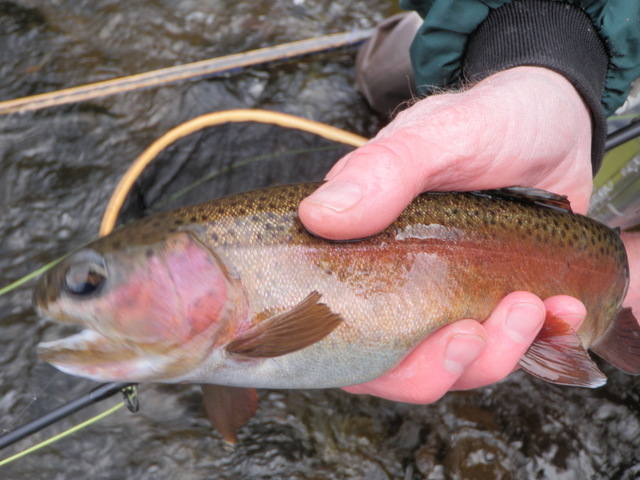 Number eleven was a gorgeous chunky rainbow that also grabbed the soft hackle emerger. I cast the two fly combination to some still water behind an exposed rock, and since the top fly was barely moving, I decided to lift and recast, but just as I began to lift the rod tip, I noticed through my polarized glasses a quick subsurface flash as the rainbow darted to intercept the rising emerger. I set the hook and the bow dashed toward the main current and downstream a bit, but I applied side pressure and kept the head up to avoid the fish going beneath any branches or rocks. I kept waiting for a late afternoon BWO emergence, and catching two nice fish on the emerger indicated that the fish were tuned into BWO nymphs, but by 4PM it had not happened, and my two fly offering was no longer generating any interest. Perhaps a deep nymphing set up would work? I decided to place an indicator, split shot and two flies on the tapered leader and experiment with nymphs. I selected a salvation nymph as my top fly and added a beadhead hares ear as the point, but unfortunately this did not produce any action in the final half hour before I called it a day and hiked back to the car. I was rather pleased to land eleven trout on a beautiful late fall day. 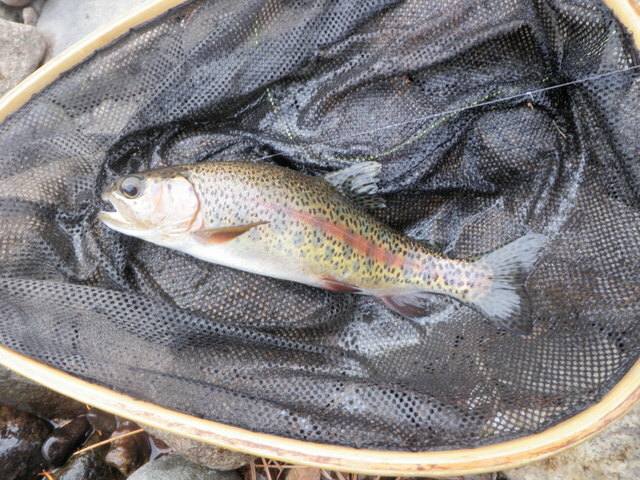 The temperature probably hit 70 degrees, and the dark stoneflies produced seven fish. I observed the stoneflies on Sunday, created a match, and used it effectively on Tuesday. Isn’t this what fly fishing is all about?